From left to right: Guy Burnet and Chad Kimball in "Murder in the First." Photo by Carol Rosegg. 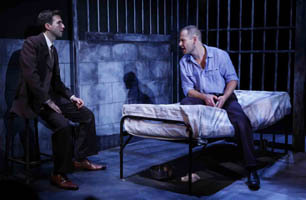 "Murder in the First," Dan Gordon’s new play, based on the eponymous film for which he wrote the screenplay, bills itself as "a gripping drama about the murder trial that blew open the deplorable treatment of the prisoners at Alcatraz, the most notorious correctional institution in U.S. history." But when you look up Henri Young, the convict whose story inspired the play, it turns out he was, in reality, a bank robber and murder, and nothing close to Willie Moore (Chad Kimball), the innocent victim of poverty portrayed in the play. As for the prison, it was closed on March 21, 1963, not because of excesses revealed by investigations, but rather because it cost more to operate than other prisons and the citizens of the area were concerned about the environmental effects of sewage the penitentiary released into San Francisco Bay. None of this, however, matters when one watches this gripping drama, masterfully directed by Michael Parva. 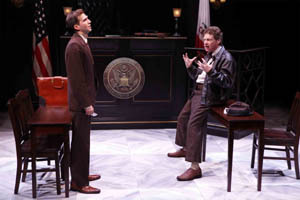 Mark Nayden’s set divides the stage into three sections: the attorney’s office, the courtroom and Willie’s prison cell. Not only does the set work perfectly for staging the play, it also defines the world that will determine Willie’s future. From left to right: Guy Burnet and Joseph Adams in MURDER IN THE FIRST. Photo by Carol Rosegg. Although there are some gripping courtroom scenes and a few emotionally charged encounters between Willie’s attorney, Henry Willard Davidson (the excellent Guy Burnet), and his brother, Byon (John Stanisci), and Davidson and his girlfriend, Mary (Larisa Polonsky), the most effecting scenes are between client and lawyer. From left to right: Guy Burnet (background), Anthoula Katsimatides and Chad Kimball in MURDER IN THE FIRST. Photo by Carol Rosegg. playing cards and discussing baseball than helping his attorney with the case. For him, Davidson is someone to talk to, someone with whom he can pass the time before his execution. Kimball ("Memphis") has internalized all the despair and hopelessness that make Willie so sympathetic despite his lewdness and occasional aggression. Burnet is every inch the upstanding attorney of so many films and television shows. But he establishes a real connection with Willie that makes the play work. For the most part, the play is true to the movie, only making those changes necessary in a transfer from film to stage. However, for some reason, Gordon decided to introduce a new character, a journalist named Houlihan (Joseph Adams), into the stage version. This is unfortunate; although Adams does a good job as the cynical newsman, the role is unnecessary and diverts the audience from the central issues of the play. This false step, however, does not take away from the fine achievement of Gordon, Parva and the cast of "Murder in the First." Even if you are not addicted to "Law & Order," you’ll probably enjoy this show.